Please consider this to be an extension of my remarks made on the form provided at the July 12, 2013 public hearing on the emergency rule and proposed permanent rule to amend Chapter Adm 2. Lt. Bob Sloey of the Capitol Police, DoA Chief Legal Counsel Greg Murray, and DoA Executive Assistant Wendy Coomer at the public hearing. What I witnessed was not a public hearing but a charade. It could only be described as the Department of Administration going through the motions required to make the emergency rule and changes under Chapter Adm 2 permanent. This is quite unfortunate because the overwhelming testimony given at this hearing was opposed to the emergency rule and the proposed changes. The people who attended this meeting, many of whom spoke with eloquence from the heart, still will not have their voices heard by this administration. That is the point of this so-called necessity for emergency rule changes to the Administrative Code. It does not matter that no emergency exists. It does not matter that a narrative has been created from bits of information taken out of context but skillfully woven together to give a semblance of a well thought out argument for the necessity of emergency rules. What happened in 2011 at the Wisconsin State Capitol ended in March of 2011 and has no bearing on what is occurring at the capitol in 2013. But 2011 continues to be used as an excuse to create “emergency rules.” This is at best disingenuous. However, disingenuous or not, this narrative will serve well as the means to the ends. Another less than honest issue demanding “emergency rules” is the actual function of the capitol rotunda. The Department of Administration has obviously consulted with legal counsel to manufacture a description of the rotunda as just another room in a state office building. 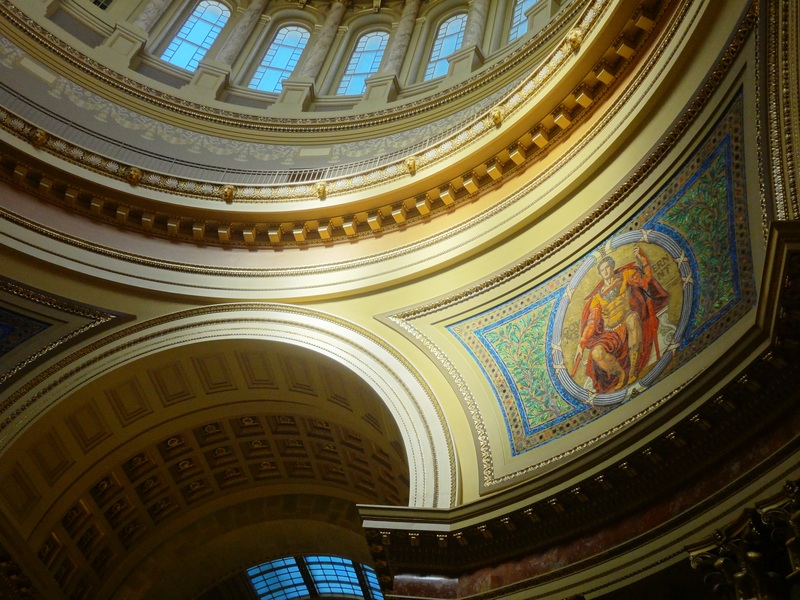 This is far from the truth and history of the Wisconsin State Capitol building. 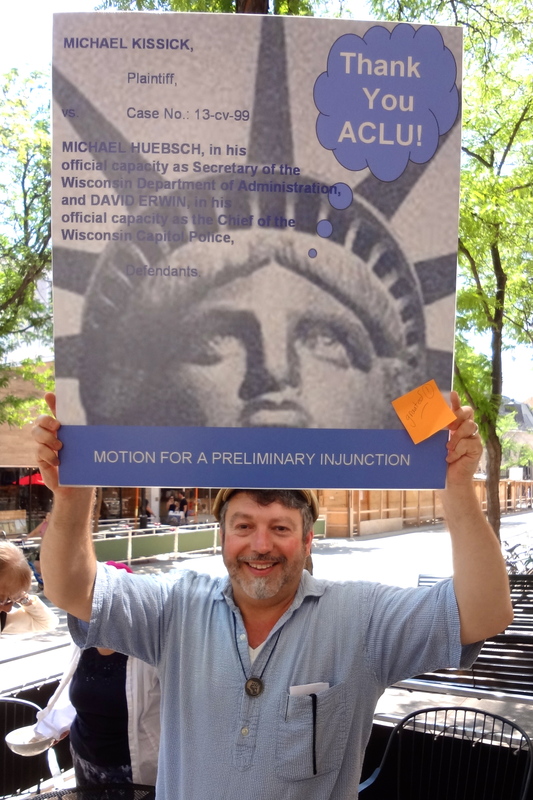 Michael Kissick holds up a thank you sign to the ACLU for representing him in his case against the DoA and Chief Erwin. 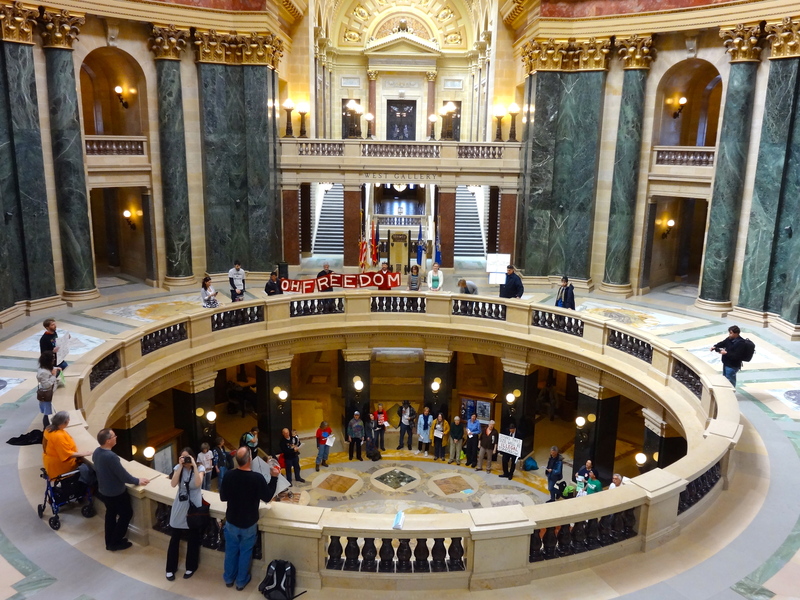 As pointed out by the State of Wisconsin when applying for National Register of Historic Building status for the capitol building – to the many people who testified at this hearing, to the people of Wisconsin who have been taught and know what the rotunda is for, to the decision and order in Kissick v. Huebsch and Erwin – the purpose of the rotunda is long-established as a place, a forum, where the citizens of Wisconsin are encouraged to gather to address their government and to exchange ideas. The Department of Administration wishes to deny this history and purpose. I personally have gathered with others in the rotunda to exchange ideas and to address my government for over forty years. Please do not try to tell me now, in 2013, that the capitol rotunda is nothing more than another room within an office building that has no higher stature than a broom closet. Then there are the talking points that have been repeated since 2012. The Capitol is an office building and nothing more. This, as you well know, is untrue. The Capitol functions as the seat of state government. The design of the capitol itself allows for workspace for our elected leaders and their staff with specific and designated chambers for our representatives to gather for the purpose of conducting the business of the people. Notice here how I did not say the business of the state. That is not the purpose of our elected form of government. Representing the people is the function of our elected leaders. This capitol building is unlike any other state capitol and the space reserved for the people our elected leaders are supposed to serve is at the very heart of the building. Another talking point that has circulated through media sources is the notion that to preserve the right to assemble and the free speech rights of those who are not using the capitol, others who are in the capitol exercising their rights of assembly and free speech must give up those rights to be fair. This misguided and disingenuous talking point is used to create a groundswell of support for restricting the original purpose of the rotunda. How better to quash free speech and eliminate the ability to assemble than to create a situation where no one gets to use the space that was intended for those express purposes. 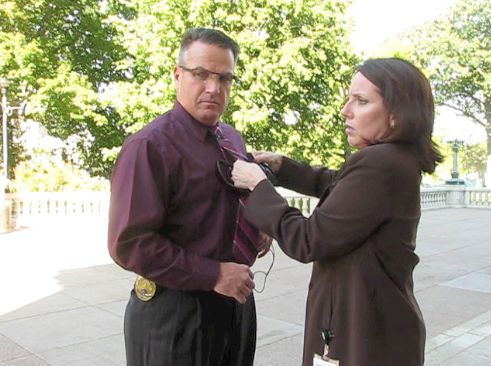 Perhaps most disingenuous of all was the talking point expressed by newly appointed Chief of the Capitol Police, David Erwin, as he made a media tour around the state justifying his new “crackdown” on protests at the capitol. He equated the protestors with terrorists. Chief Erwin did this on September 10, 2012, one day before the anniversary of September 11th. 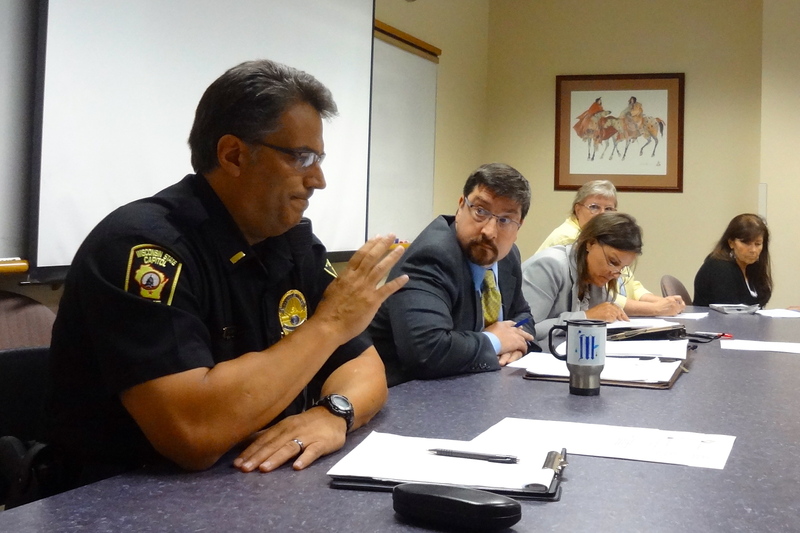 It would be difficult to argue that Chief Erwin’s remarks were not intentional. The words along with the timing and the acute awareness of the September 11th anniversary were carefully designed to provoke negative perceptions of the constitutional use of the rotunda by certain groups of people. The use of the word terrorist by Chief Erwin was incendiary, reckless and intended to create a negative point of view that was at the time and remains to this day untrue. It has been obvious since this administration took office in January 2011 that the people of Wisconsin are to be seen and not heard. If it all possible, it would be better if the people were not seen either. 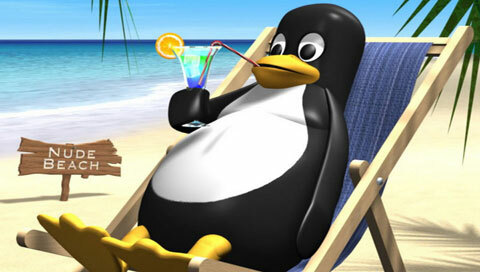 There is to be no dissent of any kind or in any form. There is to be no opinion expressed except blind devotion to an administration that favors benefactors, campaign contributors and corporations over the people of Wisconsin. The very foundation of what made Wisconsin one of the best states in America in which to live and raise a family was the progressive foundation constructed by Bob LaFollette that included clean government, transparency, fair taxation and protection of our incredible natural resources. That foundation, which served the people of Wisconsin extremely well for many decades, has now been rejected through the official policies of the current administration. Exercising fundamental and protected rights of free speech, assembly and redressing grievances are systematically being attacked by this administration as well. 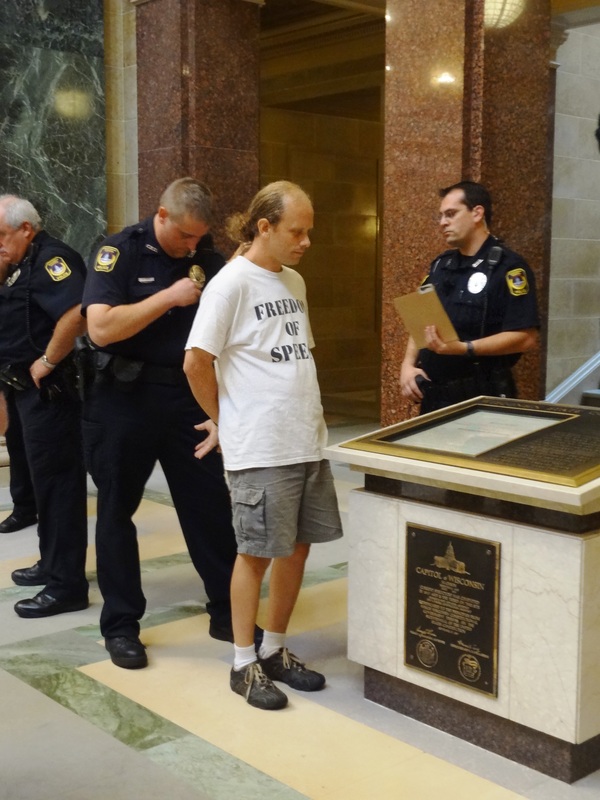 Instead of the rotunda being a place where expression and assembly could occur as citizens use that portion of the capitol designed and reserved specifically for them, the Department of Administration has turned the rotunda into a place where police intimidation occurs more readily than free speech. Activities of citizens are under constant surveillance. Lists have been made, video has been taken and notes constantly written about who is using the rotunda, when, and for how long, and for what purpose. This is the true emergency at the state capitol as the administration seeks to quash all dissent by using police state tactics; not the made up narrative supplied by the Department of Administration that has no meaning, no relevance, no facts and no truth. It is troubling to see the Department of Administration work so diligently against the people of Wisconsin instead of for the people of Wisconsin. This administration, through these actions to silence dissent and eliminate the citizens’ constitutionally guaranteed free speech, has willfully joined the ranks of fascists, tyrants, despots and dictators. This emergency does not exist except in the fiction created by the Department of Administration to provide the justification to make permanent these rule changes for the express purpose of silencing the opposition. So many resources and taxpayer dollars (mine included) have been unnecessarily expended to silence the people in their rotunda with utter disregard to fundamental rights. A charade of a process has been invoked. Testimony has been taken but I have no illusion that a single word of the testimony offered at the required hearing was heard, or that any written words will be read, let alone considered with any degree of seriousness. This is a long, drawn-out game where the end will be eliminating dissent from the people’s rotunda and it will all be justified by these disingenuous means. I have read Section 10 of the proposed rules. It appears clear what the next several moves in this game will be once the day closes on Monday and the last of the written comments are submitted then ignored. By Tuesday, this process will stop and these unconstitutional rules will be made permanent. The Department of Administration has chosen a course that defies history and truth, the U.S. Constitution, the Wisconsin Constitution and quite likely the order in Kissick v. Huebsch and Erwin. 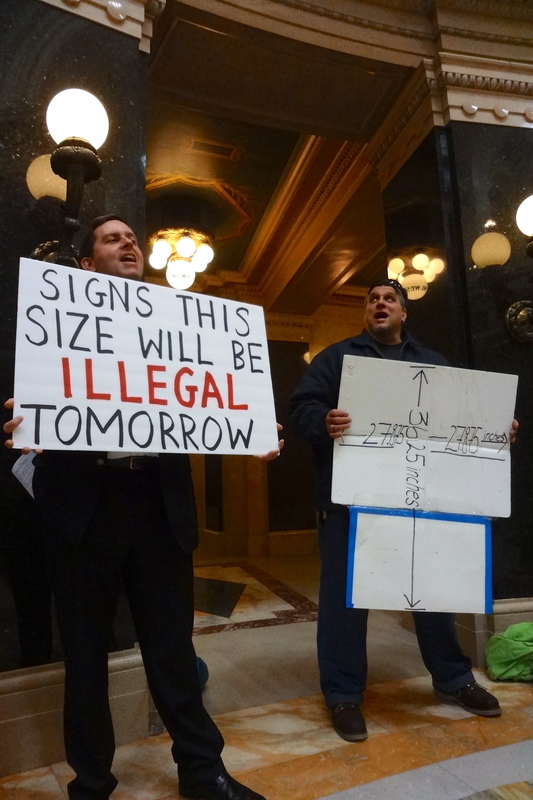 Such disregard for the citizens of Wisconsin, for the law, both federal and state, grounded in both Constitutions, have more weight and significance than mere administrative rules. The people of Wisconsin deserve better. Unfortunately, the Department of Administration will make certain the people will not receive better from their government. ← Gone to Trial for Holding a Sign? The look on Herr Irwin’s face …… precious.